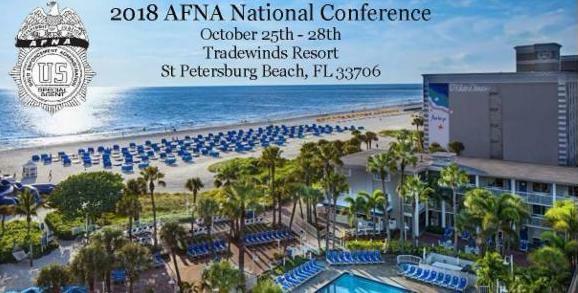 The AFNA National Conference is set for Oct. 25 thru Oct. 29 at the TradeWinds Island Grand on St. Petersburg Beach, FL (see previously send emails below for registration & hotel reservations). This is a great venue and the conference committee with hosts Dominic Albanese and Rich Crawford have set up a great program with a great menu. The hotel has given us a cut off date of Oct. 3rd for the guaranteed AFNA rate ($189) so please make sure to register at the hotel before then. the Bayou Golf Club has sets of Titleist clubs available for $55.00. If you desire rental clubs, please let either Dominic Albanese (dominic.albanese@pepsico.com / 813-728-8843) or me (rkcdea@aol.com / 239-470-4824) know in advance so we can give the golf club an accurate count in advance. We are in need of sponsors for this year’s conference. For those members with their own business, we ask you to consider a sponsorship for this year’s event. For those working for a company, we ask you to ask your company to consider a sponsorship. All sponsors are recognized in the conference program and with signage at the conference. In addition, all sponsors are listed on the AFNA website and certain levels of sponsors have their company logo and website listed on the AFNA website as well. To view the Sponsor Letter & Form, click BECOME A SPONSOR here or go to the AFNA website https://www.affna.org and click BECOME A SPONSOR. If you prefer, contact me and provide the name and contact info for the appropriate person at your company; I will forward them a sponsorship request letter on our AFNA letterhead. …………..The below email was previously sent July 25, 2018…………..
We have acquired a great venue for this year’s AFNA Conference, Oct. 25 – Oct 28, The TradeWinds Island Grand 5500 Gulf Blvd. St Petersburg Beach, FL 33706. I invite you to check out the website at www.TradeWindsResort.com to see all that the venue has to offer. The hotel has agreed to extend the special AFNA rate of $189 per-night; the rate applies to hotel stays arriving on or after Oct. 22 checking out by Nov. 1 (see reservation link below). Below is a tentative conference schedule. We will be making the AFNA Agent of the Year presentation at the General Meeting on Friday Oct 26 therefore we have decided to forego the formal banquet dinner in favor of a “Floribbean” (Florida/Caribbean) buffet on Saturday Oct 27. We feel this will be more convenient for the attendees and lend itself to the resort atmosphere. (Dress is Resort Casual). I believe you will find the menus quite enjoyable. I urge all of you to please register early so we can better plan the event (see registration link below). If you are bringing a guest, please register him/her at the same time by clicking ‘Guest Information’ on the top of the registration page. We especially need to hear from those desiring to play in the optional golf event, Oct. 27, on whether you want rental clubs or specify your foursome.Those interested in playing golf should contact either Dominic Albanese at Dominic.Albanese@pepsico.com or myself at rkcdea@aol.com (you will still need to include the cost of golf on the Conference Registration). For those traveling from out of town by air, I would recommend using a car service from the airport to the hotel rather than renting a car. There are a number of restaurants on the property and some great ones within walking distance and the attractions in downtown St. Petersburg are a short Uber ride away. We are working with the Chamber of Commerce and will be posting info on the best transportation rates available. Hope to see you all in October. Rich Crawford, Conference Coordinator, is working diligently on finalizing the details for this year’s AFNA National Conference, October 25th – 28th at the Tradewinds Resort St Petersburg Beach, FL. In the meantime, check out the below links to explore what to look forward to! ………….Below email previously sent March 7, 2018………………. Rich Crawford, AFNA National Conference Chairman, has asked to share the below regarding this year’s conference. Mark your calendars!